My friend Dave Corntwhaite and I have just completed a mini adventure, in the form of a 150 mile Stand Up Paddle journey from Bath to London along the K&A Canal and the River Thames. ‘Stand up paddling?’ I hear you say, with a bemused look on your face. Well, it is exactly what it says on the tin. You stand up on a big surf board and paddle with a long paddle. Besides acting as a training run for our respective future expeditions, our aim was to encourage lots of people out on the water with us to complete as many Blue miles as possible. A blue mile is a mile travelled on or beside the water, and is an initiative set up by the Blue Project, for which Dave and I are both Ambassadors. Clocking up hundreds of blue miles between us and our accompanying paddlers and cyclists, we paddled under Tower Bridge on World Oceans Day, June 8th. While we weren’t at sea, the Thames is tidal below Teddington and of course this time last year I was out at sea on my very own piece of ocean, so it was important we landed on this day. The adventure was full of thrills and spills, lots of funny misadventures and an awful lot of portages where we had to haul out and walk our boards around whatever obstacle was in our way, including 38 locks before breakfast on one day. Thankfully there were a few chocolate bars floating about, too, so I was happy! Lots of people have said that it was a bit of a step down compared to the Indian Ocean last year, but I disagree. Of course it wasn’t as long and was very different- you can see where you go on a paddle board, I had company, we had people feeding us and driving a support van and of course I had to wear clothes all the time – but it was still a challenge and full of all the things I think adventure should be. The hardest thing was actually standing up for twelve hours a day – I had never considered how much it would hurt my feet. For now I am supra busy with talks and finishing off my book to meet my publisher’s deadline, so I leave you with a little trailer of the documentary we shot and some of my favourite comments shouted at us from the banks. Enjoy. A final thank you to all of our wonderful team and our sponsors for helping us make this happen, and all the lovely people who joined us en route to tear up some miles. That was very cool…perfecting the joys of adventure! It looked like you had fun. Glad it all went well. Good to have you home again for a while though. 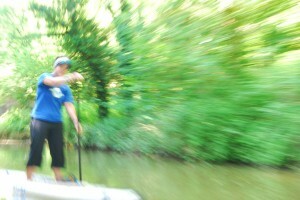 What a fab video of a great stand-up paddle! What made you scream in the tunnel?! Well done to you both….lovely film! Speak soon, I hope? Well done on your recent achievements. Will be thinking of you especially tomorrow 13th. 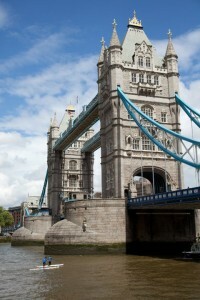 Sorry I wasn’t able to get up to Tower Bridge to meet you in like I had hoped as I was in London on the 8th. Take care for now and good luck with your next venture. So inspiring at what you do ,always happy and inspiring ,You make challangers so enjoyable and easy to accomplice. TAKE CARE for this time ,hope to hear more from you soon. TERRY B . WEST AUSSIE !!!!!!!!!!!!!! !